After choosing the style of narrow boat you want to build, and answering all the relevant questions you may have, the first real building step is the Shell. This is a massive welding task, and should not be undertaken unless you are more than confident in your metalworking abilities! There are many companies who will be able to help with, or supply you with the shell pre-built. Click HERE for more information on just such a company. When choosing the design of your shell, there are two important features which effect the look of the boat and should be considered very carefully. 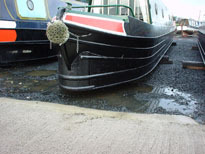 There are three main designs of stern used on Narrow boats. - Traditional, Semi-Trad and Cruiser. The Traditional stern dates back to the heyday of narrow boating, when the barges were used to carry goods around the country. This Style incorporates a small rear deck, and hatchway into the body of the boat. The helmsman stands in the hatchway in order to steer the boat, leaving little or no room for a second person. Thus this design leaves the rear of the boat a very solitary place, but does provide considerable shelter from the wind and rain on poor days. The Semi trad stern is an adaptation of the Traditional stern for modern residential boats. Although the sides of the boat continue back to the rear deck, the roof is cutaway, providing an area for passengers to stand or sit with the helmsman, rather than leaving the rear of the boat deserted. From the side or from a distance, the barge can appear as if it is of a traditional style. 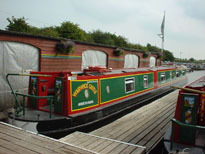 The Cruiser Stern originates in hire boats, but is still popular among private barges. It gives a large rear deck which can be adapted to have seats along a rail at the rear, allowing many passengers to use the rear of the boat while in motion. When parked, the rear deck can accommodate folding chairs so that you can enjoy an evening sat outside. There are many variations on the design for conventional narrow boat bows, although there are two common styles - Josher and Tug. Josher's are named after Joshua Fellows, of "Fellows, Morton and Clayton", one of the early carrying companies on britain's canals. 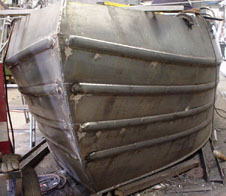 The bows of these boats are long and slender, and today will often be produced with false rivets to simulate the style of the older barges construction methods. Tugs on the other hand will have a long foredeck, often ten feet or more in length. The Design is based on that of the Tugs which were used to tow other craft around the inland waterways. The problem with this style, is the space that is wasted under this deck, which is of little use except for storage, or child's beds (if they can cope with the cramped space!) But the style is very distinctive, and is often a popular choice when the interior space is not too much of an issue. Although modern narrow boats often have large rectangular windows to maximize the light inside, the traditional port holes are still popular among the traditionalists, even though they often lead to a dull, gloomy interior. An easy compromise for this is to use a combination of both, with portals in the aft cabin. Also large glass skylights can alleviate this problem. The Eco Hull was designed by a team of researchers at a Scottish university, which minimizes the drag. When buying a shell, if you decide that the welding task isn't for you, then make sure you buy from a well known manufacturer, such as Boat Building UK, as buying a less well known, or poorer quality hull may mean that the value of your boat depreciates in value quicker.